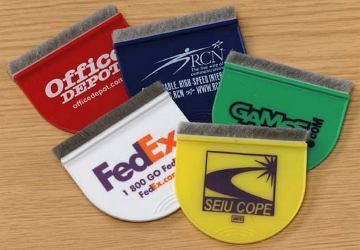 Bulk promotional computer screen and keyboard brushes -dusters at the Budget Prices in USA and Canada. Our computer brush is a must for all computer users. The larger imprint area creates a billboard display for your advertising message. Attaches to monitor with provided velcro. Unique new bristle design cleans screens and keyboards. We also supply blank (not imprinted) computer dusters for $0.75 each and personalized computer dusters with rush production of only 3 days, at an additional cost: see the Price Table below. Free artwork design. We will send you a proof for your approval before production. Unit prices below include your 1-color custom imprint. Add the amount shown for each extra color. Standard Service: 7 working days after artwork approval. Blank (not imprinted) computer dusters cost $0.75 each (minimum of 250) and may be shipped the same day. Product Size: 2 3/4" Brush x 2 1/2"
Imprint Area: 2 1/4" x 1 1/2"